With warnings of more cold weather on the way I’ve wanted to ensure I leave a supply of food out for the birds during this vital period. Currently birds will be building up reserves ready for the breeding season. Already I’ve seen a few birds investigating my nesting material. But with the temperature dropping they will be needing high energy, high fat sources of food.The ground is frozen making many natural food sources hard to get. 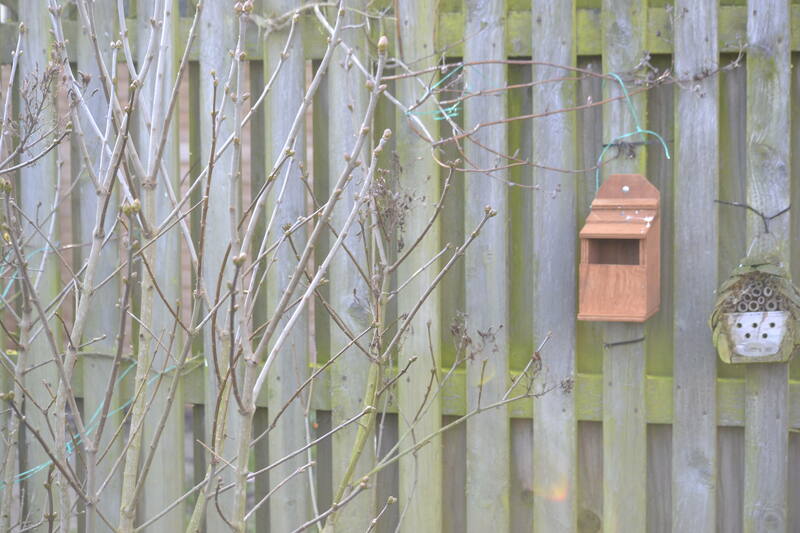 I have several seed feeders, but these get drained in two or three days. So if I have a busy week at work I don’t always get out on an evening to restock them. 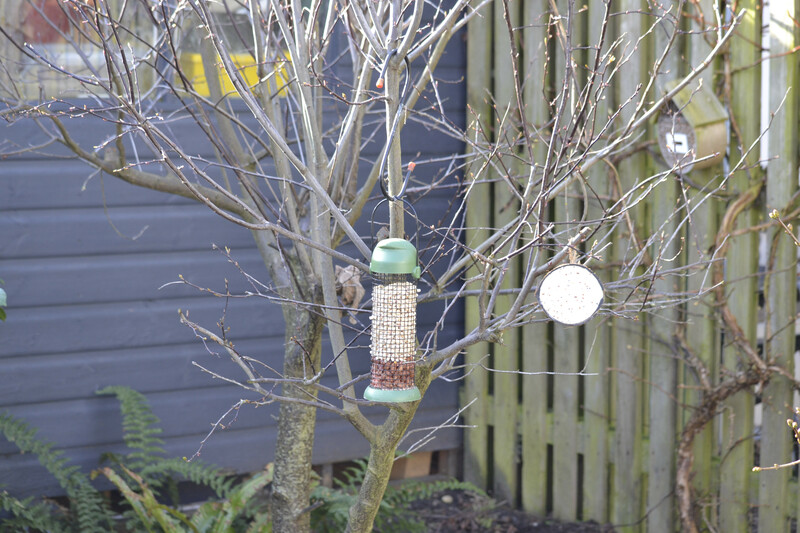 The suet feeders and fat balls usually take longer to get through ensuring even when the seed runs out the birds still have food supplies in my garden. As I was low on suet I went on Haith’s website to see what they had going and found a good value suet starter pack for £14.82. Haith’s have previously given me freebies to review, but this was not. I use Haith’s as the quality I do believe is better and when buying in a reasonable quantity it isn’t badly priced. 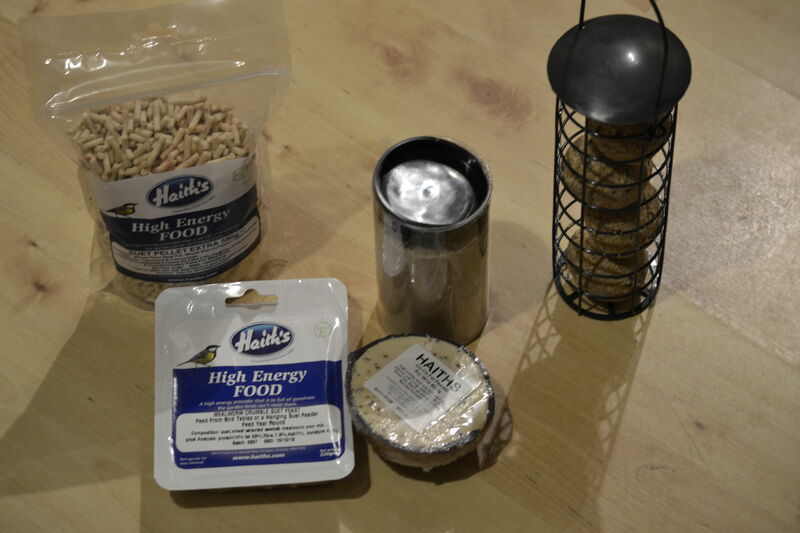 In this starter pack I received suet fat balls and feeder, pellets, suet block, a coconut feeder, and a bird cake. Getting out to put it out though meant separating Alice from her new Gruffalo costume, courtesy of the charity shop for £1.50. 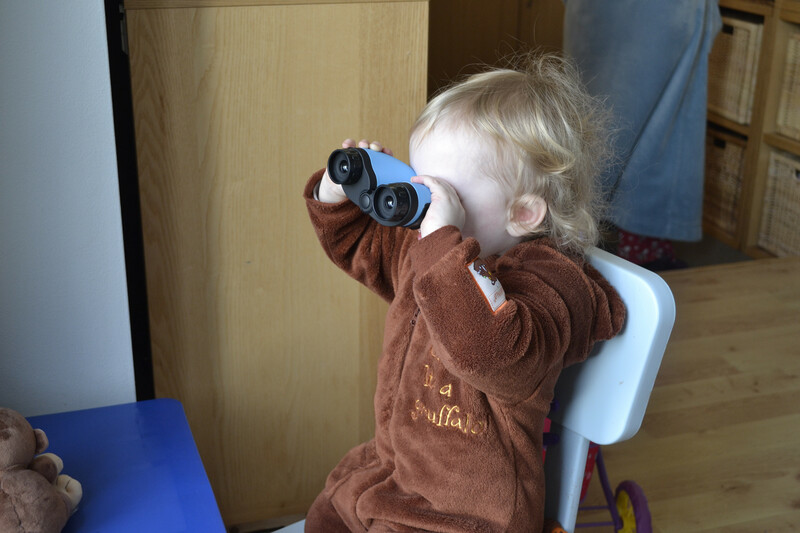 She has also been spoilt by her granddad with a set of binoculars after a previous blog. Though she hasn’t quite got used to which end to look through. 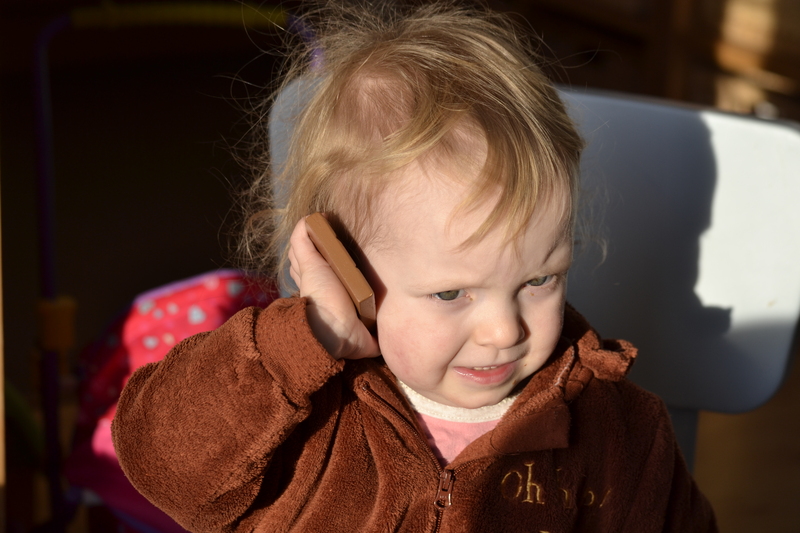 She had a few phone calls to make on her chocolate phone. Now Alice was ready we got out to put out the new fat ball feeder and restock the feeders. The coconut feeder has string on just to put up on a branch. 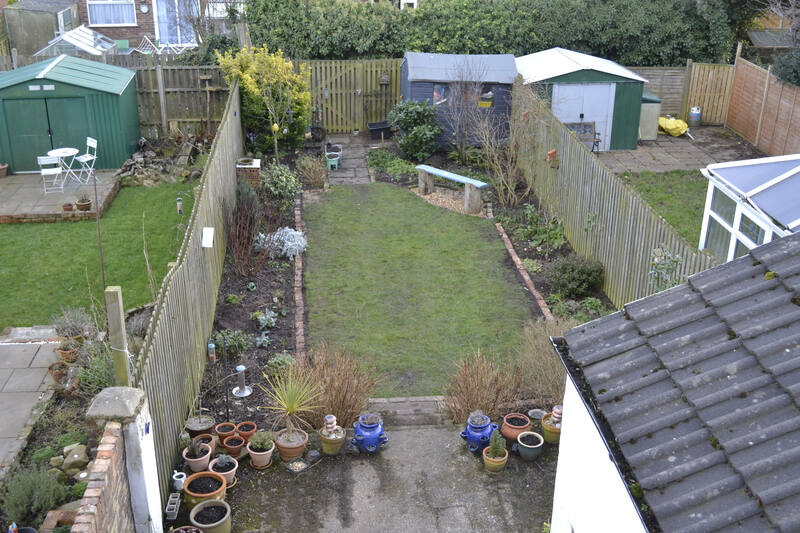 The cake, block and other pellets went up at the far end of the garden. 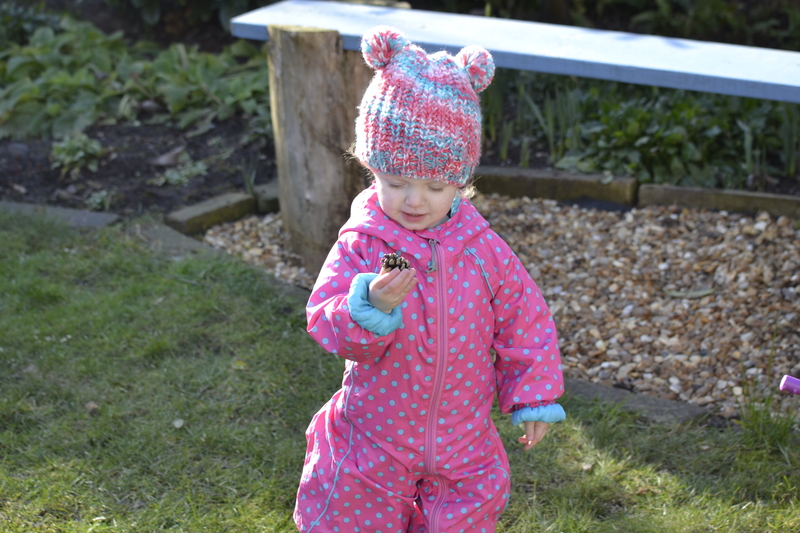 Alice was excited by a fir cone she found in the bug hotel. 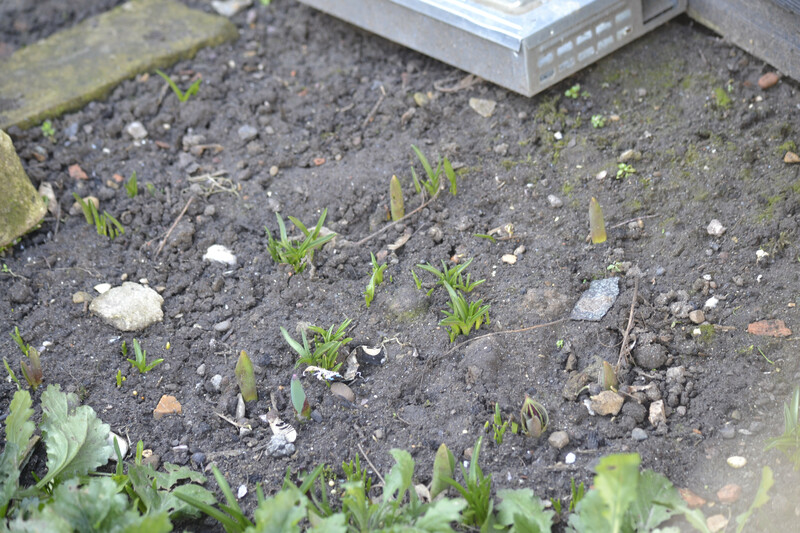 My snowdrops seem to be running behind the schedule of other locally. Blue bells and tulips are poking through further with each week. Now I can sit back inside to do my school work watching the birds enjoy their feast. Last year for my birthday my mum bought me a rather lovely hebe. Unfortunately it had lost its label. I have a vague idea of what it is, but I’d like to try and grow another. I’ve had reasonably good success at keeping bought plants alive, but I’m trying to establish more now from seed and from cuttings. Partly to develop my gardening skills and partly to garden frugally. So just before Christmas I took two cuttings of my hebe. 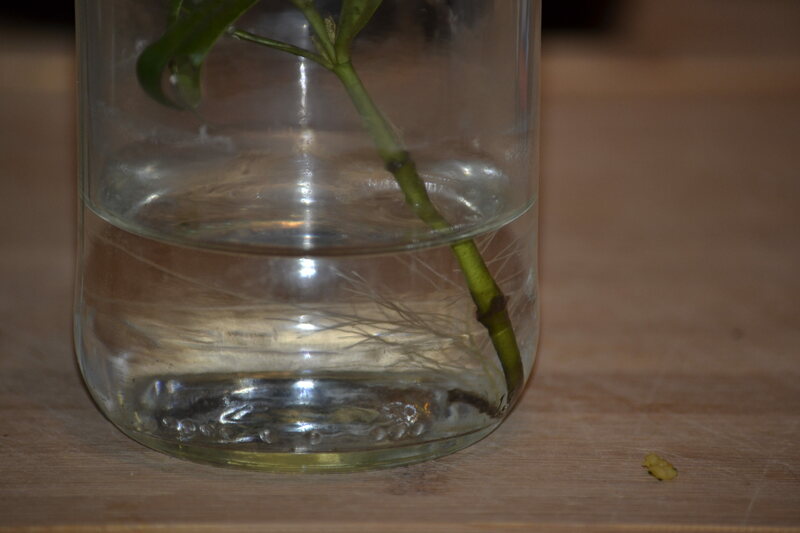 I had a theory that it would root just in a jar of water as it is similar to willow, though on a different scale of size. I couldn’t find any references to this, but thought I’d give it a try. In my work as a teacher I wanted to show the children how roots develop. So I think they would have rooted easily in a pot of soil, but it’s nice to see them develop. Two months on it looks like my theory was right. They have both started to form good root structures. 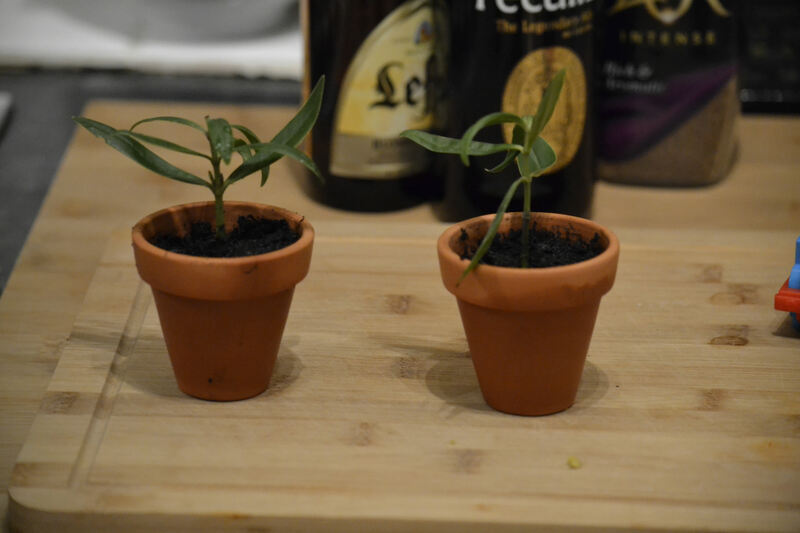 I think it’s time to transfer to soil, so I’m starting them in the mini terracotta plug pots. So with soil added I’m now going to see if they grow to go on to fill a larger pot, then eventually, with some luck and care, they’ll make it outside. I’ve no idea if it will work out or not. Wish me luck! But even if it doesn’t the experiment hasn’t cost me anything to attempt. 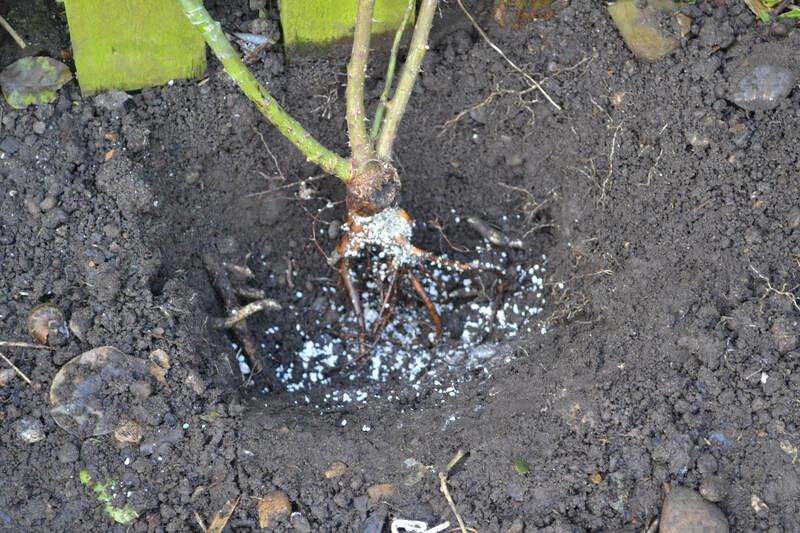 Today’s focus is on planting roses. I’ve removed several roses that had too many years of neglect or were in bad places. I don’t want to lose the long lasting colour from the roses though. 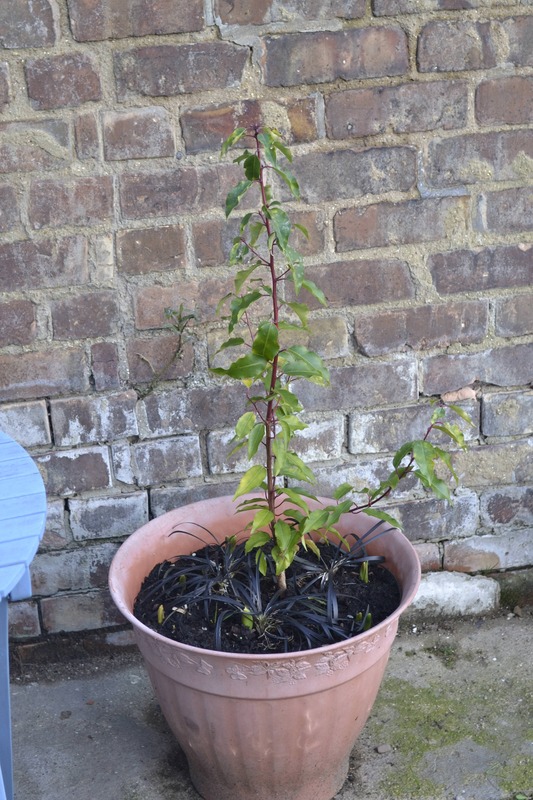 Currently I’ve planted two rosa Paul’s Scarlett climber. These will hopefully give me a nice burst of colour through a long period of the year with a bit of care. 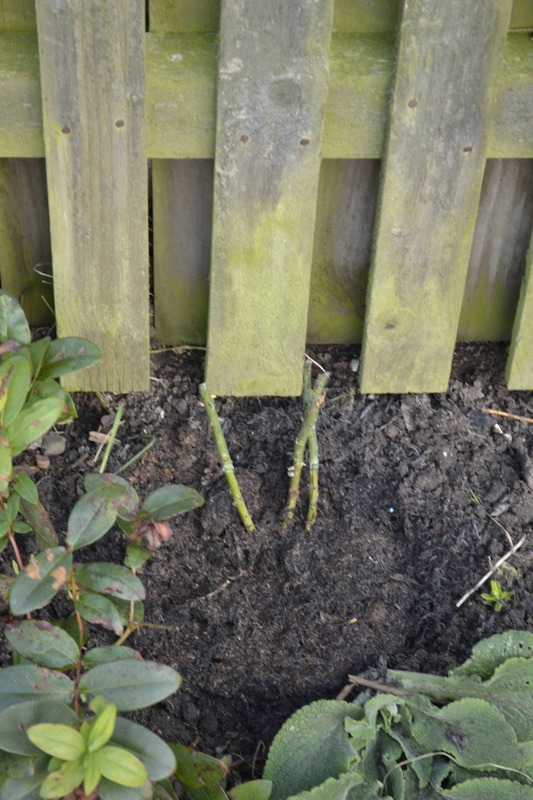 To give the roses the best start I’m putting a bit of care into the planting from the advice of the RHS and Monty Don. 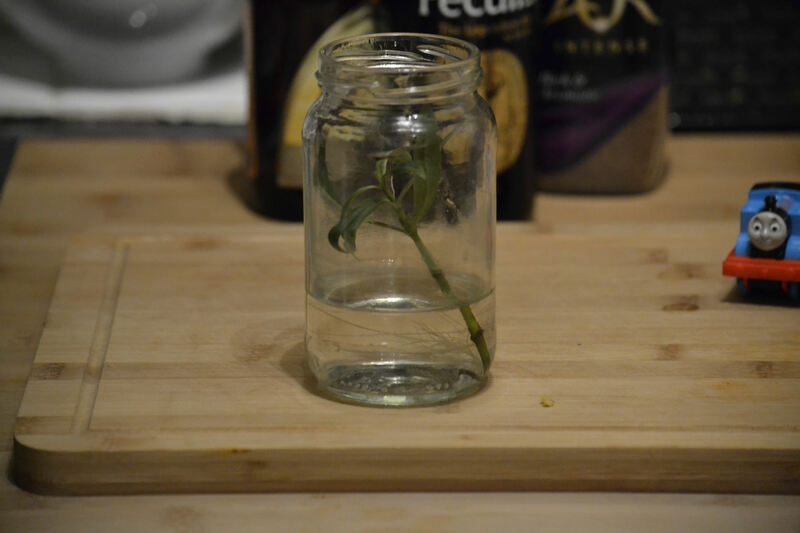 The rose came with the roots wrapped in plastic. 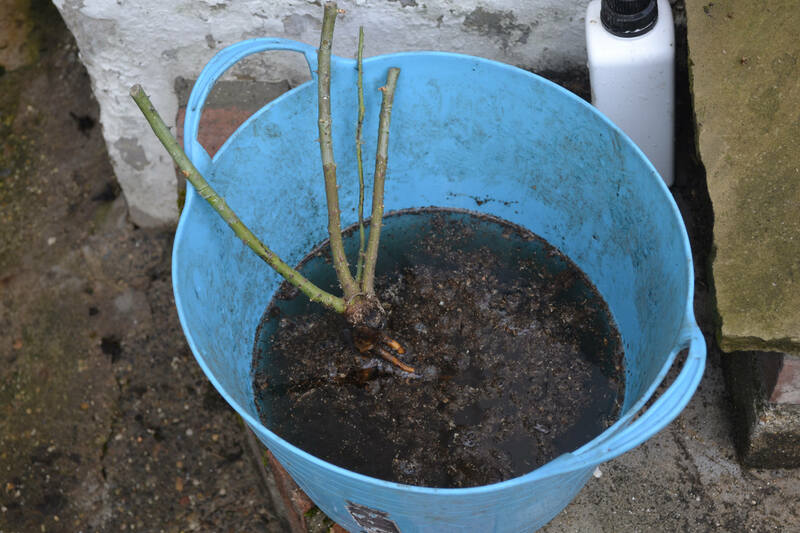 First the plastic needs removing and then the roots need a good soak. I left it in the trug for about an hour. This helps the plant get started soaking up a good amount of water and gives the roots a bit of flexibility for planting. 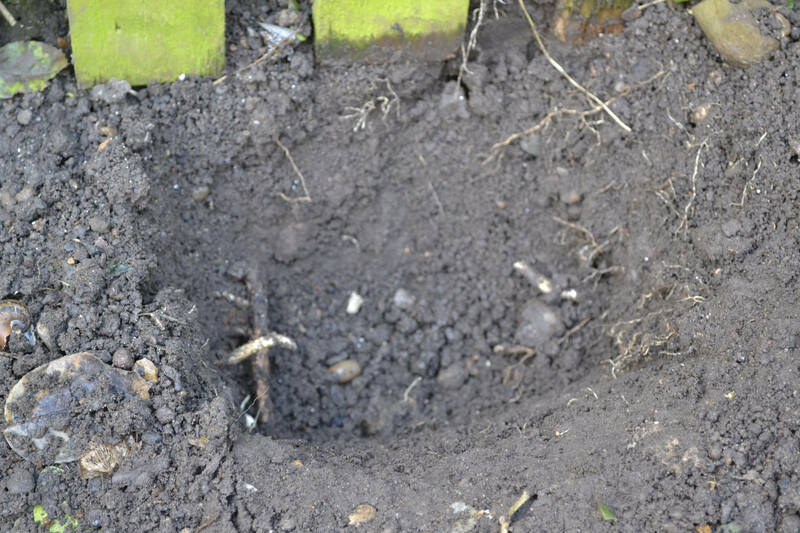 Dig a hole a bit deeper and wider than the root ball. Some people recommend putting in slow release feed balls with the roots. 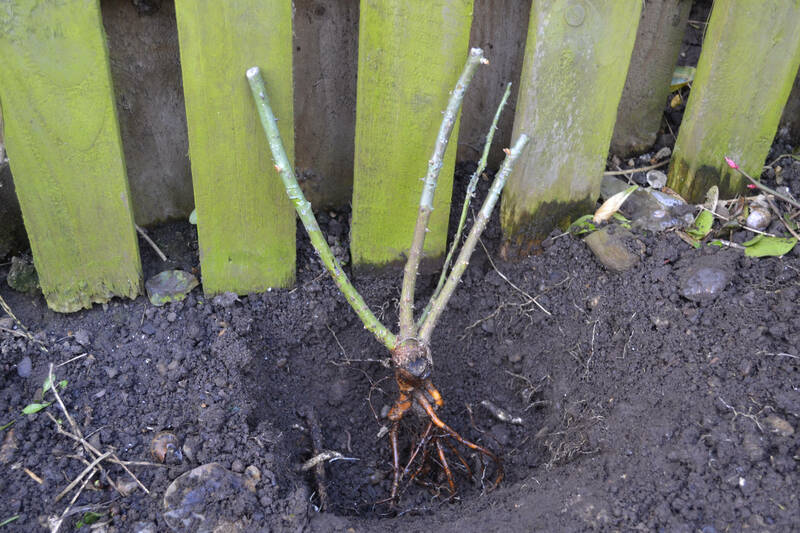 However this will mean the roots don’t grow out to look for their own nutrients. 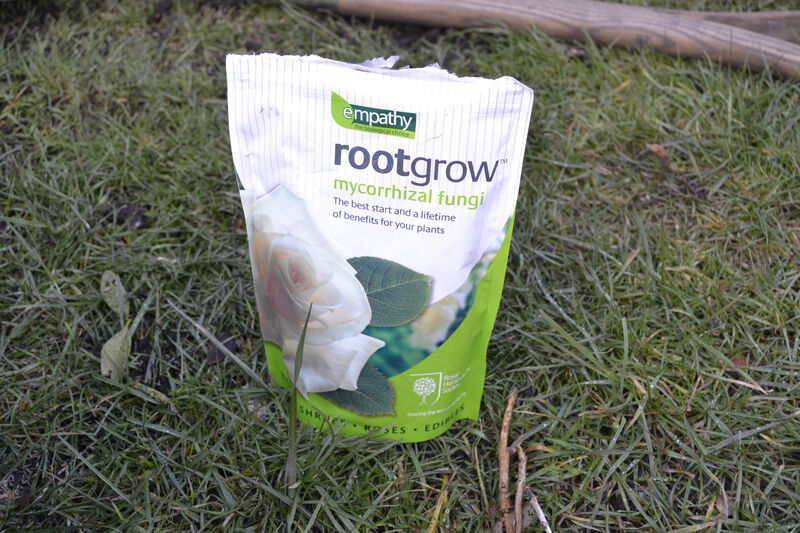 Instead I’ve used a little bit of mycorrhizal powder on the roots. This is a fungus that forms a symbiotic relationship with the plant helping the plant develop stronger root systems and take in more nutrients they need. The packaging recommends two scoops for a plant this size. So one bag will go a good way. 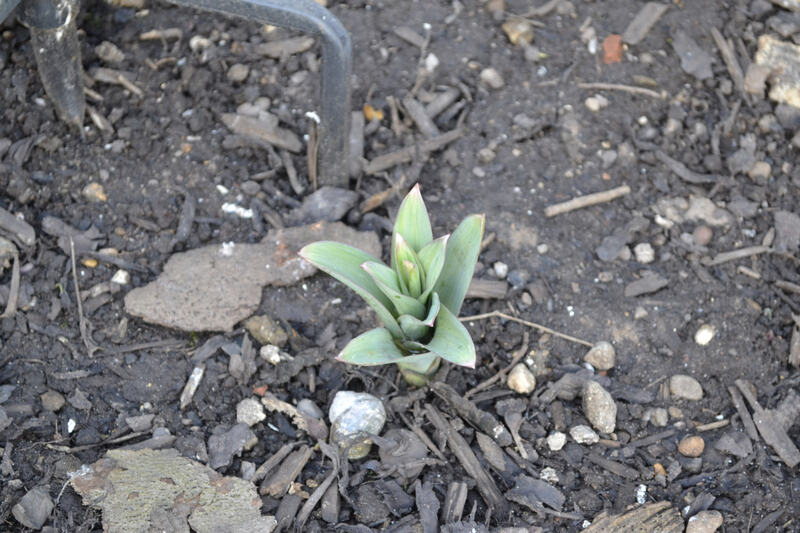 It can also be used if moving plants to help them re-establish. Then another soak filling the hole up. Then back fill the hole with fresh compost. I’ve buried the rose deep. Advice on this will differ. The rose has a nice expanse of fence to grow up. There is clematis nearby that can intermingle with the rose. It’s a fairly traditional combination that will hopefully complement each other well. I also had time for a few quick DIY jobs too. 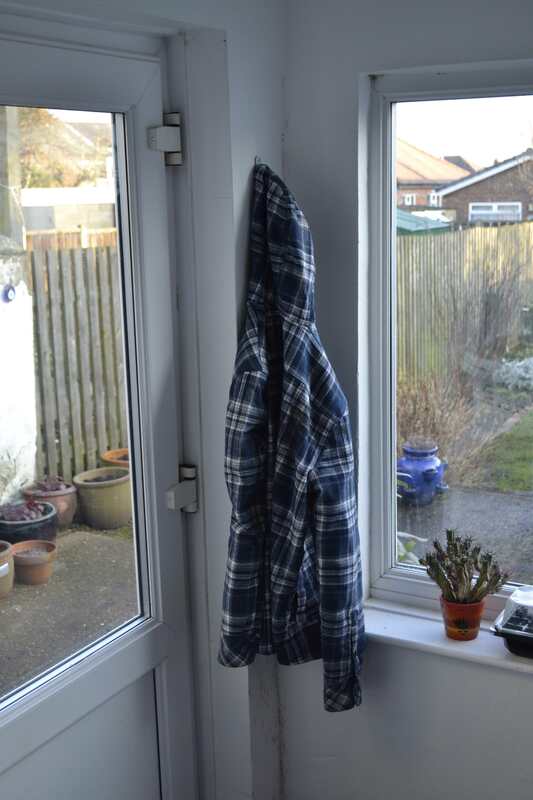 My garden jacket is always a mess in the utility room. 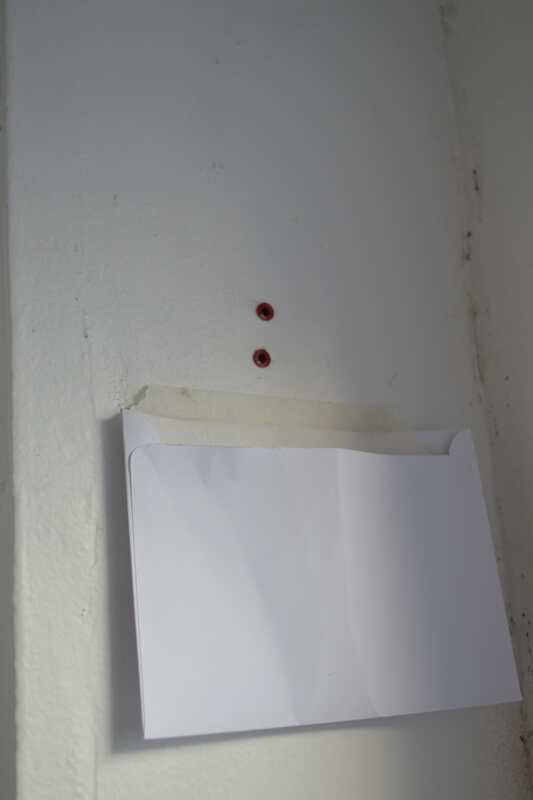 I have few DIY skills, but here is a a quick tip I got from Amy’s dad is to masking tape an envelope below drill holes. This catches the dust avoiding some mess. 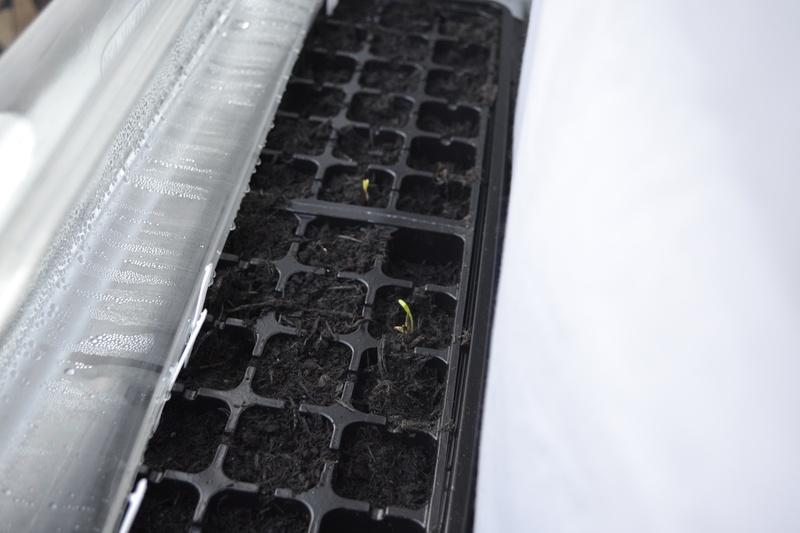 My first seedlings of this year are poking through now. Always an exciting moment. The cosmea being the first to show. 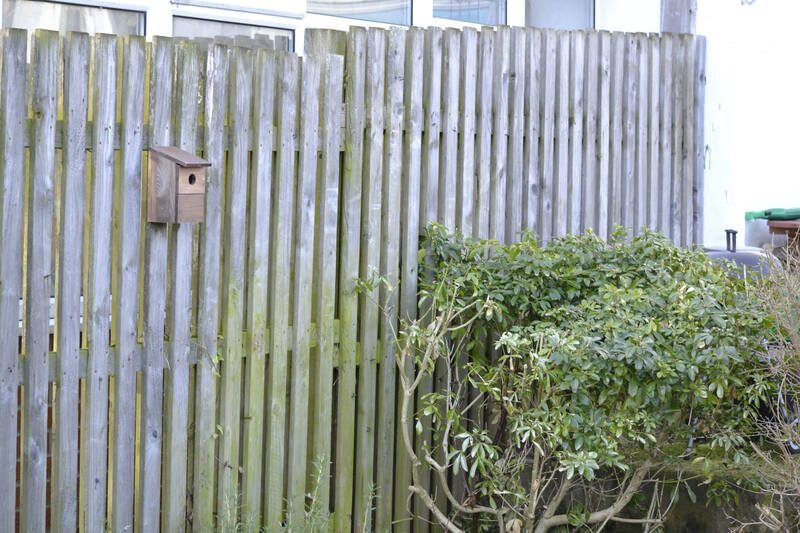 Hope you’ve found something useful from today’s blog and hopefully I’ll have nice blooms up the fence as the year goes on. 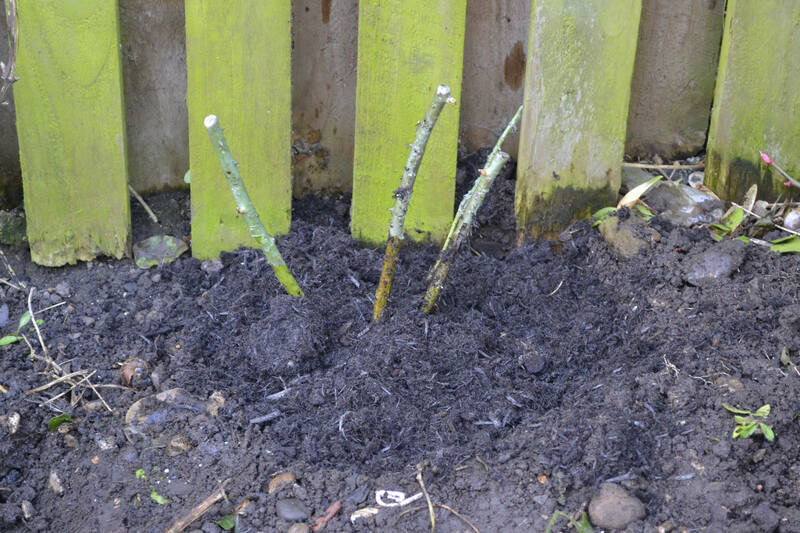 Comment if you have any further advice to watch out for as my roses establish. 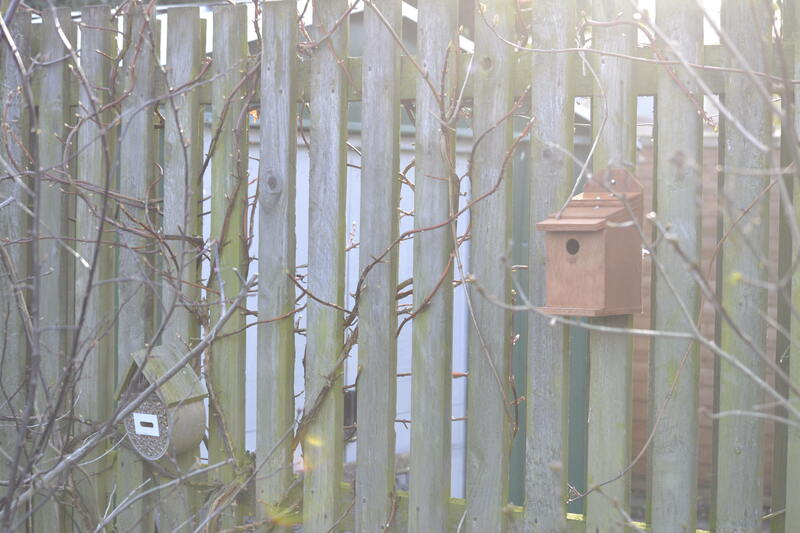 A quick shout out for the British Trust for Ornithology (BTO) National Nest Box week. My local area currently has a good supply of natural nest spots. But with new housing estates destroying many of these I’m aware the birds may be short of nest spots in years to come. Traditional advice is to place between 1 and 3 metres. Some species do have specific height requirements, so check if you have your heart set on particular species. 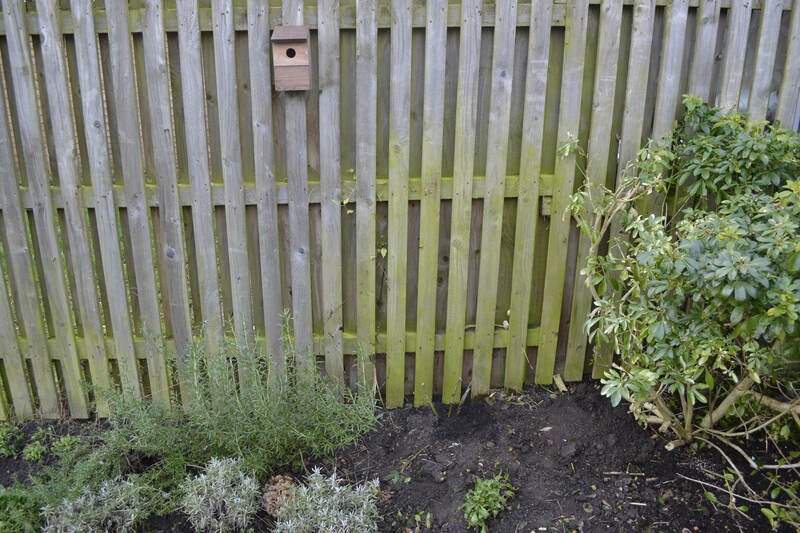 Open fronted nest boxes should have a bit of cover around them. Mine has a lilac tree in front and honey suckle growing over the fence. 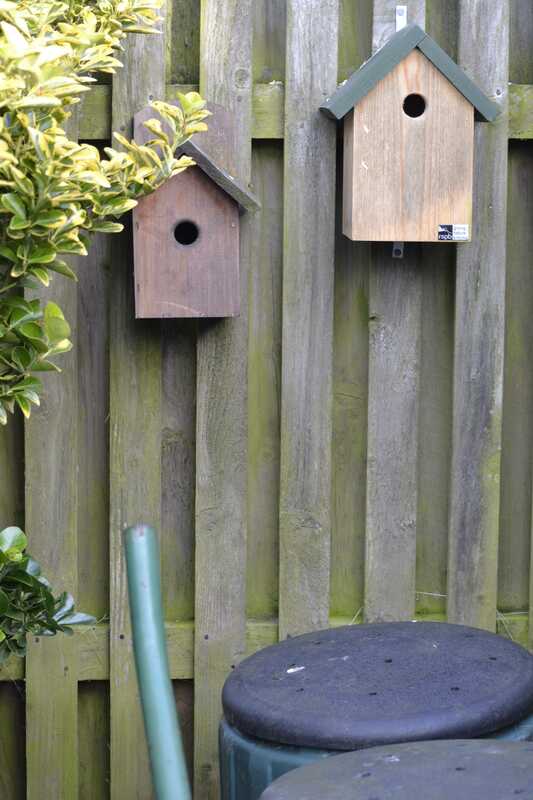 These open fronted nest boxes are favoured by robins, pied wagtails and wrens. 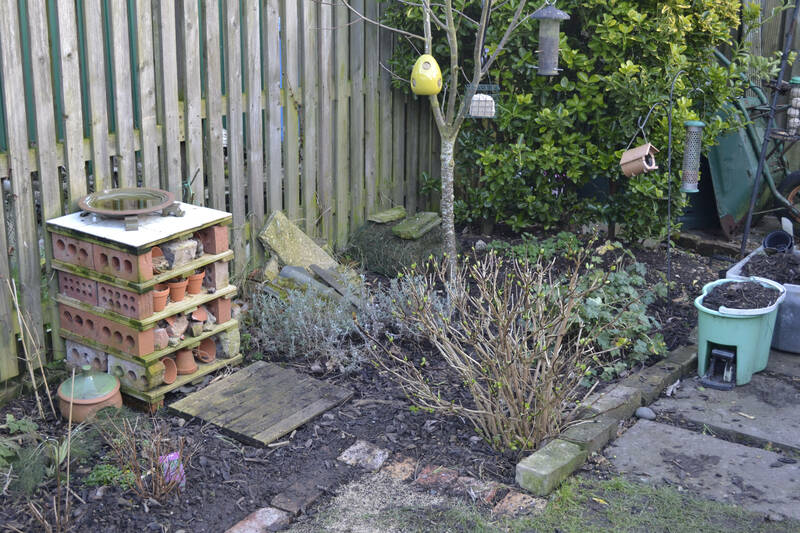 Nest boxes shouldn’t be placed too close to feeders as these may make an area too busy putting off nesting birds. 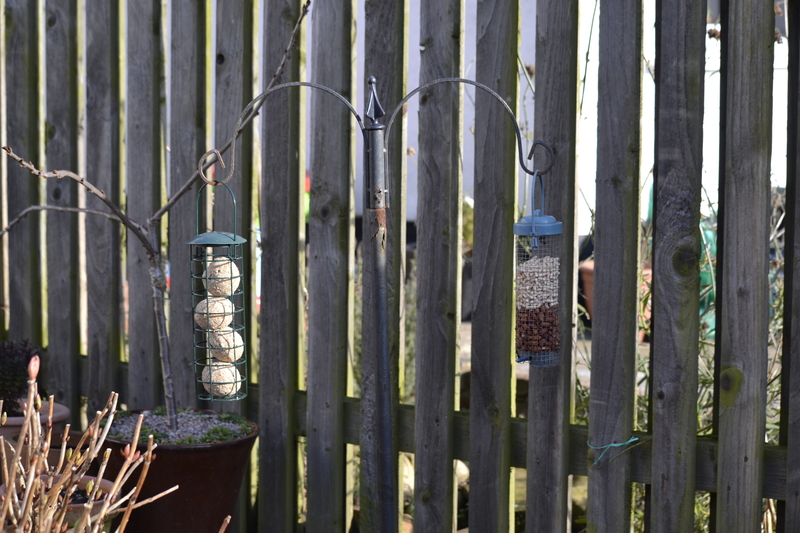 This is tricky in a small garden like mine, as I can’t put either too close to the house, so I’ve tried to place the feeders and nest boxes with what distance I can apart. Birds need clear flight paths into the nest, but it helps fledglings if there are branches they can get out onto near the nest box. If you have predators in the area ensure cats can’t get to the boxes. 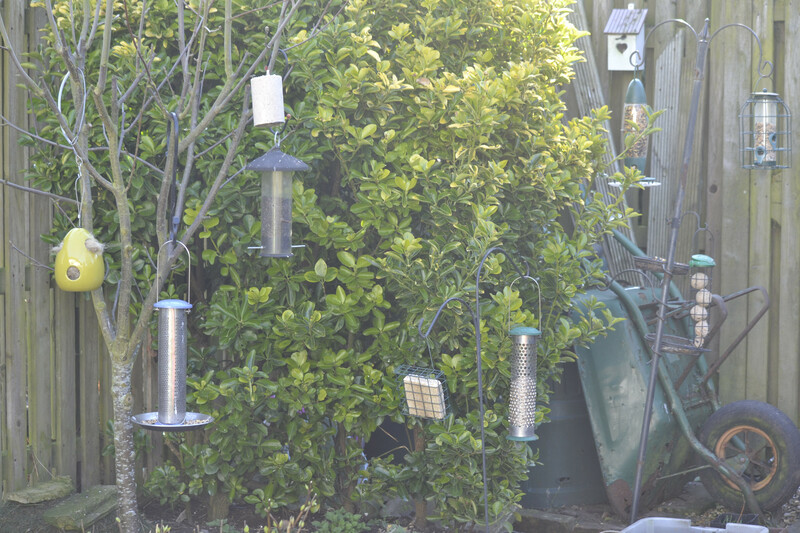 Metal plates can be used around the holes to stop squirrels and some other birds attacking the eggs. In addition to the nest boxes I have nest lining materials in the garden. Natural wool in a hanging store and straw are available to be claimed. As this is only my second year in the house I’m not relocating nest boxes yet, but if in another year none of have been used I may try different spots. Follow on twitter to see if I have any nesting success. Alice is eagerly waiting to see if anything comes, imitating my binoculars with her popoids. I can see I’ll need to get her set. Today saw my parents visiting. After a trip for lunch at the Floral Hall we headed out for a walk along the seafront.It was a nice day for it. The sun was out and the day was was calm. No chilling Winter winds today. 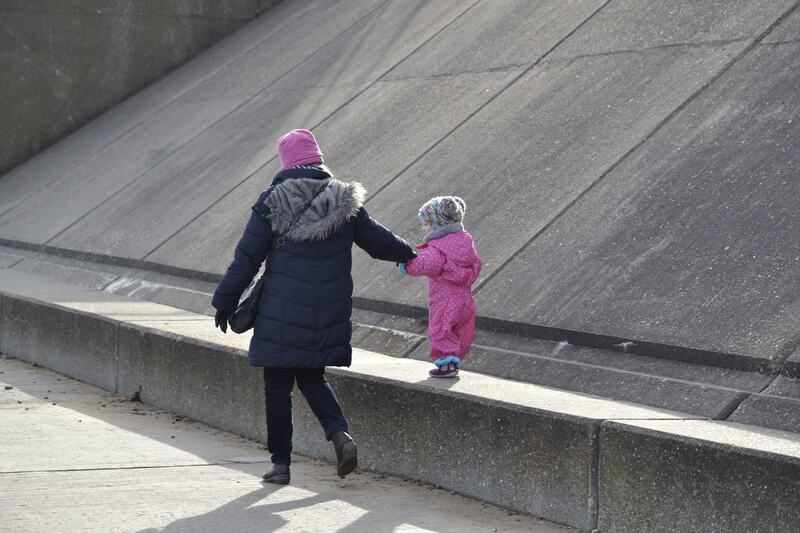 Alice enjoyed walking with my mum along the sea wall. Increasingly she wants to run. We got down onto the beach. 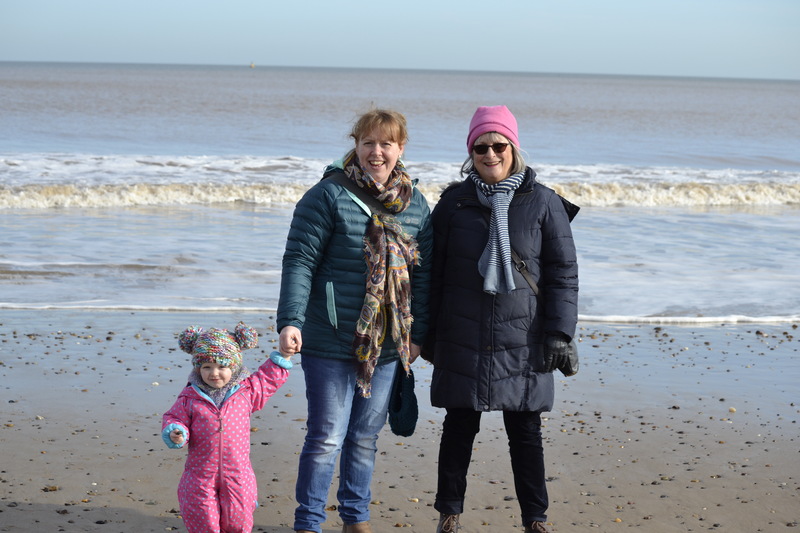 Just a few months ago Alice was very reluctant to walk on the sand. Now she’s trying to throw herself into the water. 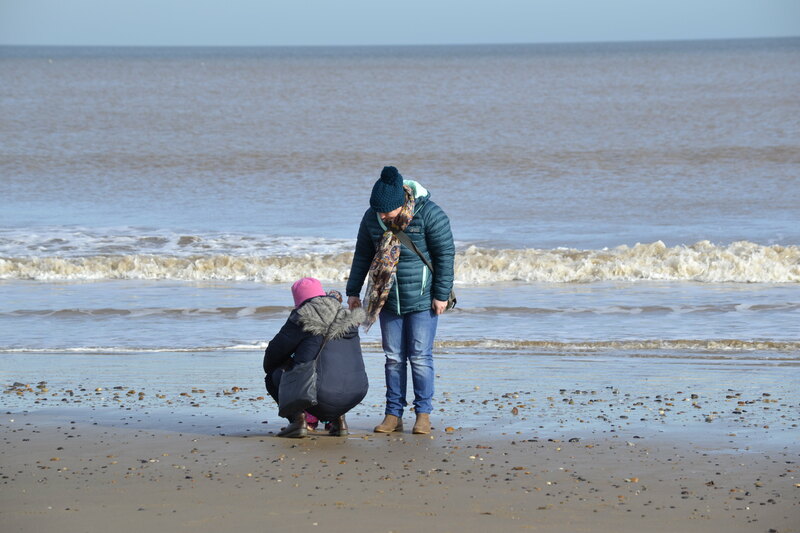 Each time we go along the seafront she finds a couple of stones she doesn’t want to part with. She is very particular over which she takes. I can’t see any particular reason she wants the ones she takes, but she clearly does. 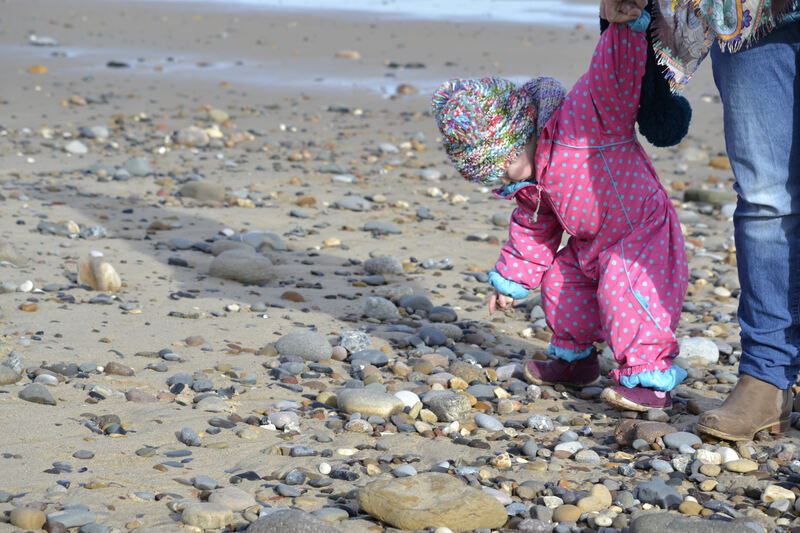 In each photo you will see her hands are tightly clutching a pile of stones. 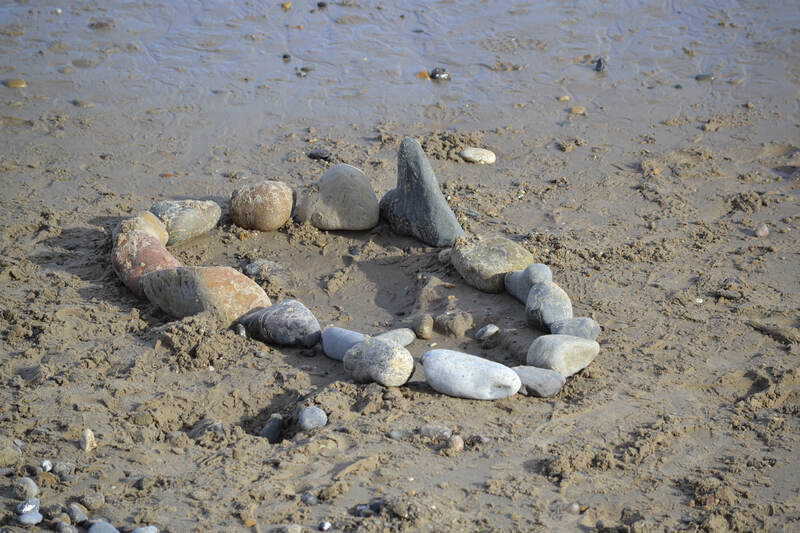 Some other visitors had made a good rock circle. A distant bird, possibly a dunlin. 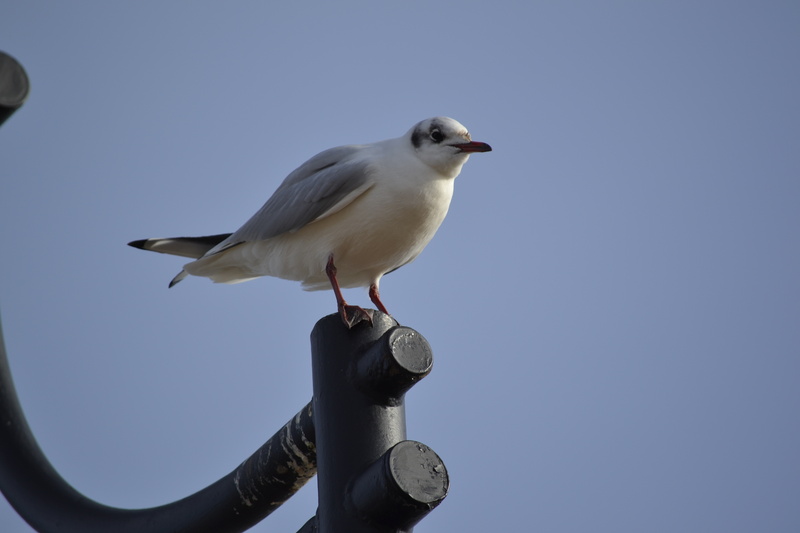 A more accommodating photogenic gull. I think it’s a black headed gull, but with the gulls all being white with some black I still haven’t got my eye in on identification. 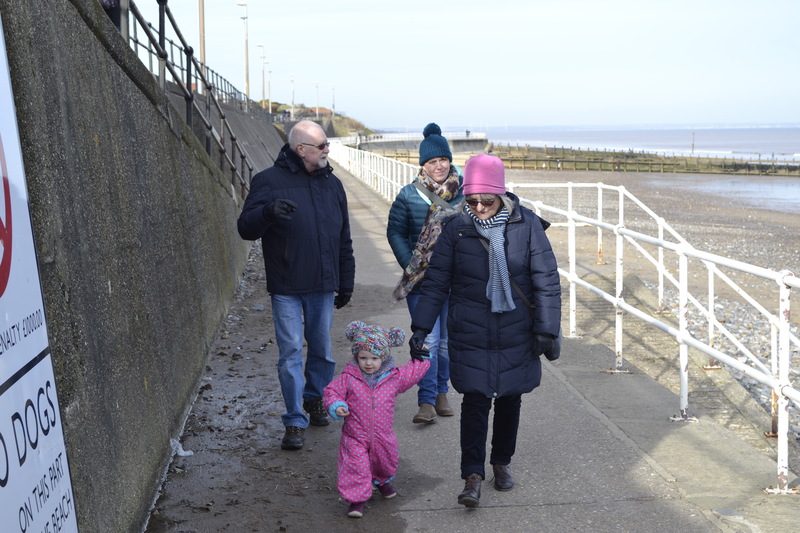 A nice stroll along the front and an ice cream on the way back. It’s good to see Alice becoming more adventurous. Then with parents gone I still had time to work in the garden to finish the seeding from yesterday. Yesterday I got out to finish the edging started earlier in the week. 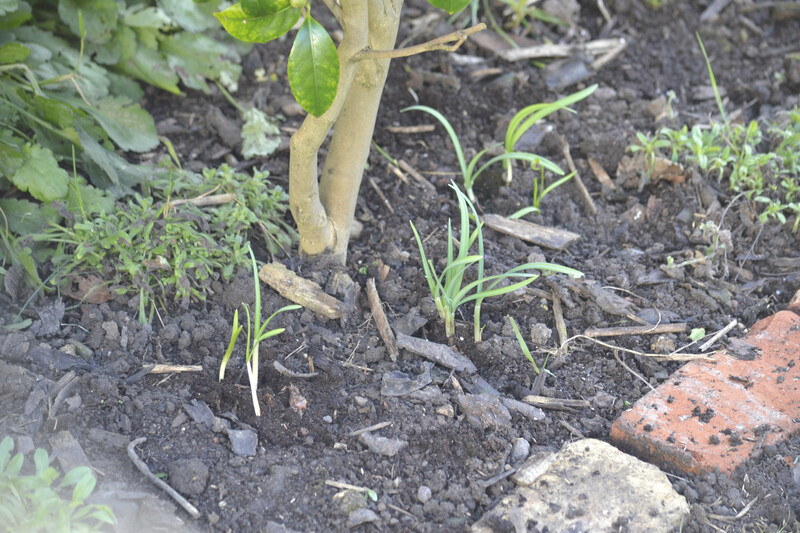 Upcycled bricks have been used to give the lawn a marked edge. The view from the upstairs windows shows it best. It’s just added a bit of definition to the borders. 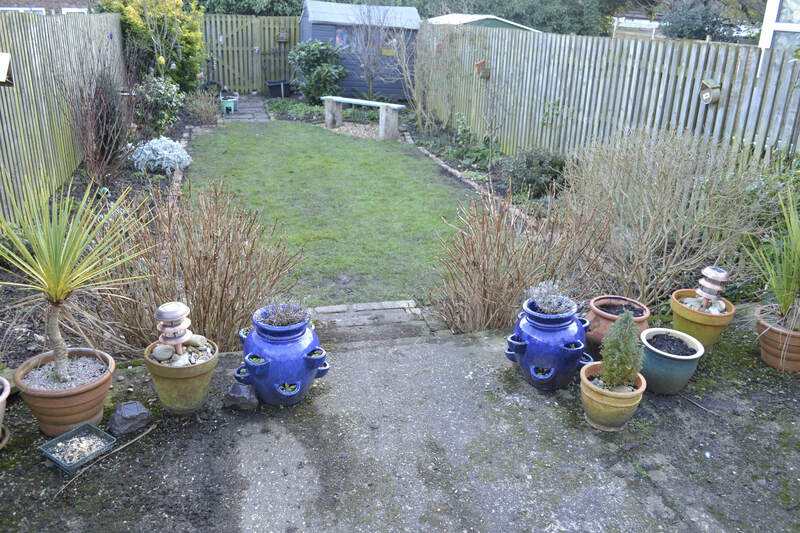 I’ve got a few areas where I need to spread grass seed to extend the lawn to where the bricks are. Overall I’m quite happy with how it looks, but may need to a bit further work levelling them. The next hardscaping job I think is to put a path in. Walking over the patch at the bottom of the steps is leaving a bare patch. I’m unsure whether to go basic and just do stepping stones or an actual path of slabs. Or may go for something more fluid like a curving gravel path. The hydrangeas have had their haircut for the year. Not something I would have planted. They came with the garden, but with all the rain run off from the patio they do wonderfully here. They flank the entrance to the lawn nicely. It’s a balancing act though of cutting the flower heads off, trimming back so we still have a path, but not cutting too much to stop blooms. The hydrangea at the bottom of the garden near the bug hotel had its trim as well. The bluebells are starting to come through in this corner. From last year it looks like they are starting to form decent clumps. 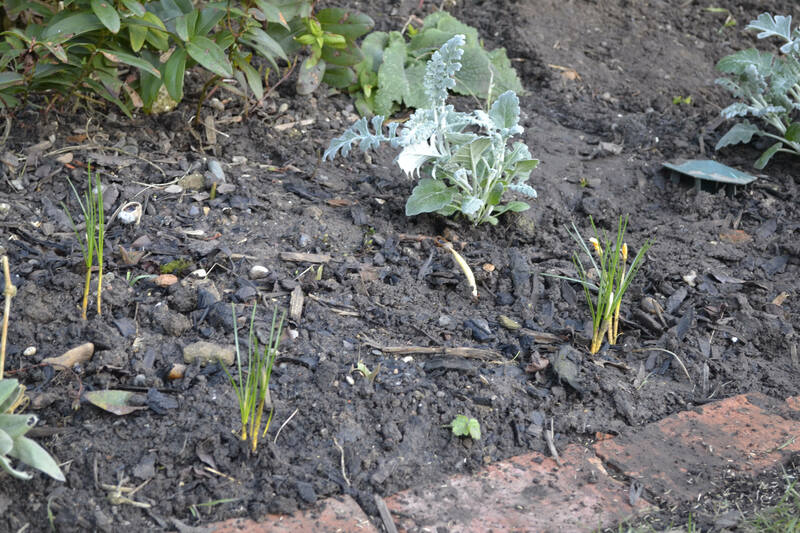 Last year I planted some crocus. They didn’t really take off, but this year they seem to be establishing better. 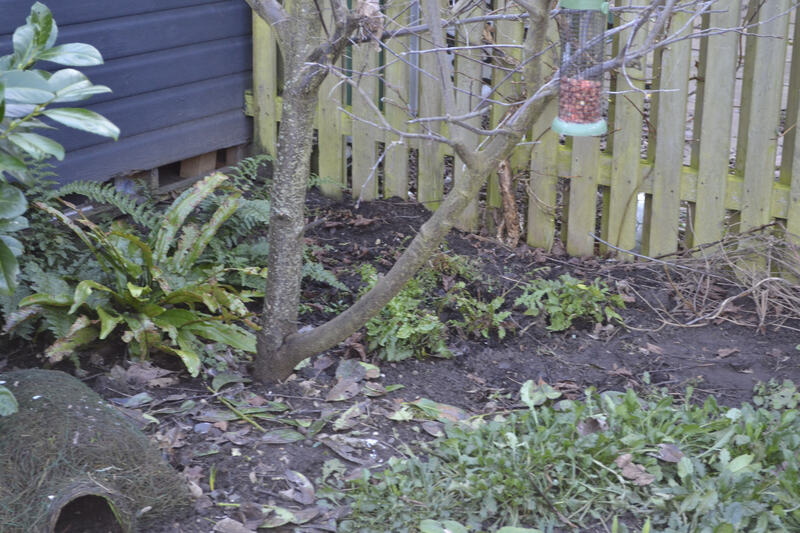 I’m continuing to add ferns near the shed in the difficult to weed space to supress the weeds. 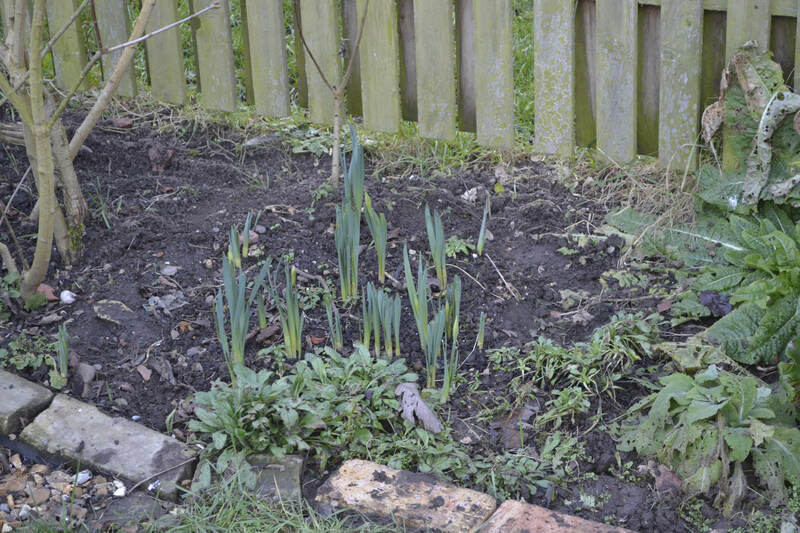 Daffodils are springing up around the border. And one over eager allium. On the patio the tulips around the prunus angustfolio are poking through. 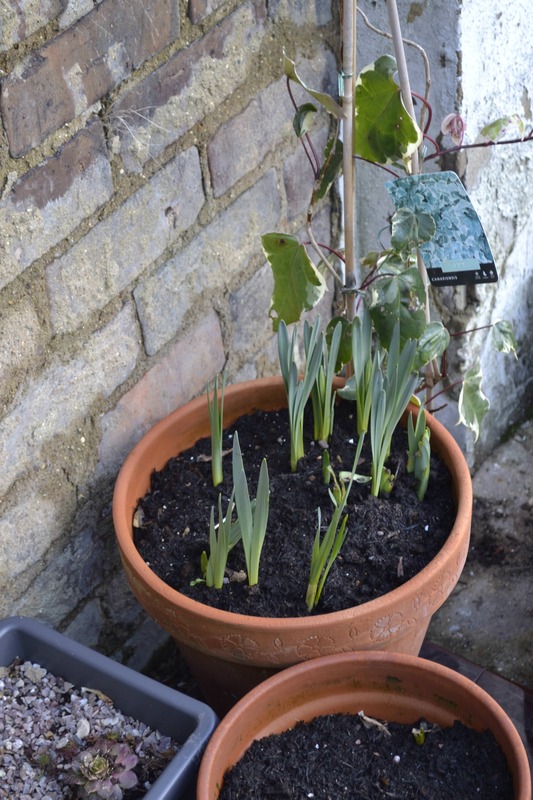 And the daffodils in the pot are coming through. They made an early dash to bloom. Then, with colder weather, seem to have thought better of it. With the daffodils, snowdrops, blue bells and then a little later on the tulips I’ll hopefully have more happening in Spring. A little more for pollinators than last year. My seed trays are planted up. I’ve planted hollyhock, morning glory, cosmea, verbana and sweet peas. I’d like to do some more, but that’s all the space filled. My foxgloves from last year have self seeded all over, so that’s good. I’d like a nice mix of cottage garden flowers. I’ve taken out two roses that came with the garden. They’d been neglected a good while. I’d tried reviving last year, but I don’t care for the position that much either. So I’ve cut my loses and dug them out. To replace the loss I’ve added a Paul Scarlett Rose climber a little further along the fence. You shouldn’t place new roses where old roses have been. It encourages disease and poor growth. I’ve gone for climbers as I’d like the gradually cover the fence in climbers and would prefer having the thorns to the back of the border, rather than working though them. With a good weed done it should all look nice over the next few months as colour comes in. 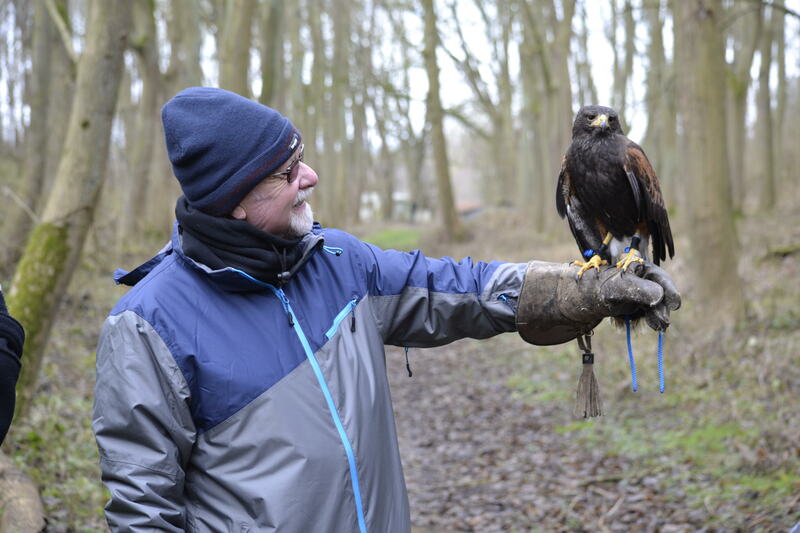 Today saw me out with my dad and nephews at South Cave Falconry. We previously visited to see one of my nephews fly a hawk at the end of the Summer. 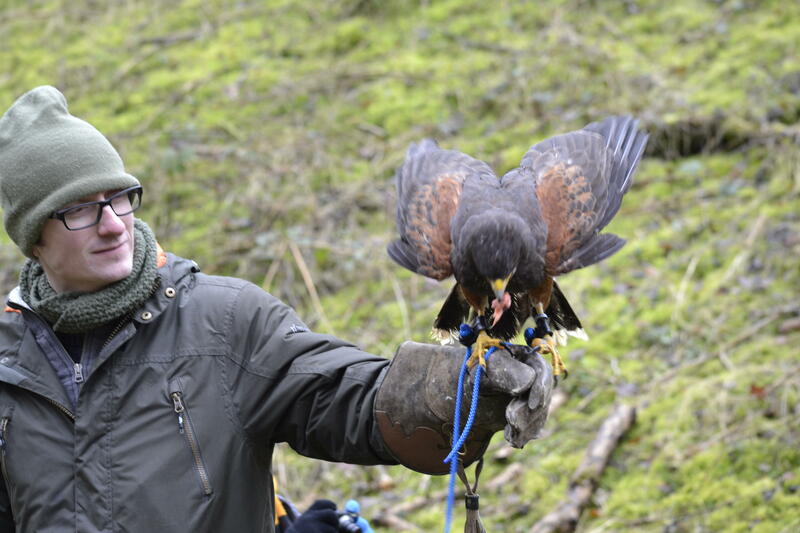 For Christmas we booked a hawk walk for my dad with space for one other to share the experience. 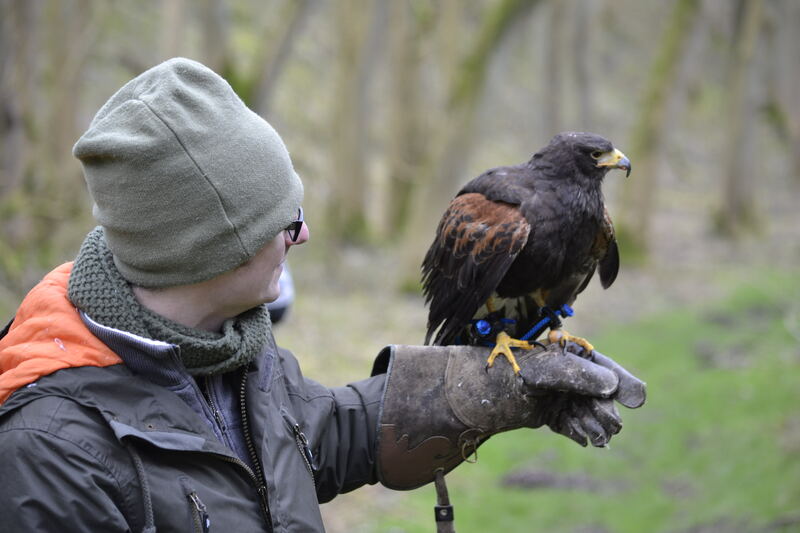 The hawk walk takes you from the centre through the woods with one the centres handlers. 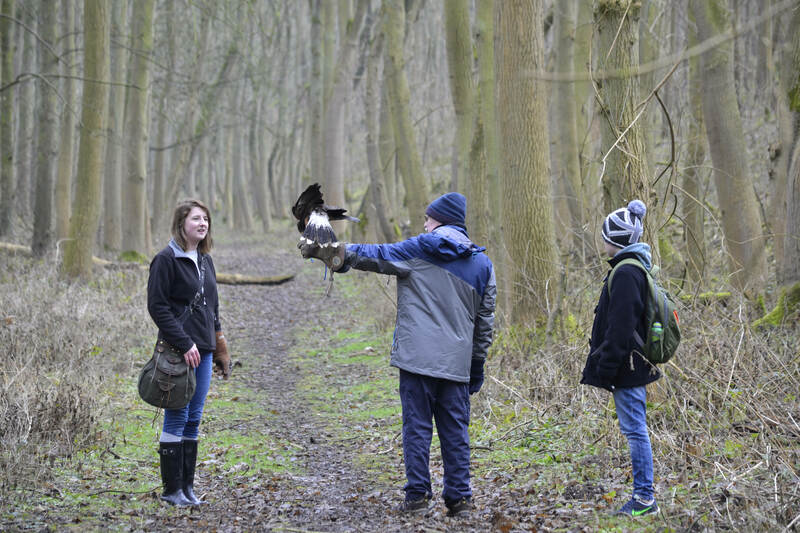 As you go the hawk leaves your arm to explore the branches and returns to your arm for food. My dad had his turn on the way out. The hawk explores the trees, stumps and the ground. On the way out we were heading uphill, so the hawk mainly stuck to short flights between branches and back. Then on the return walk I took my turn with the glove and the hawk did slightly longer glides as we headed back down hill. 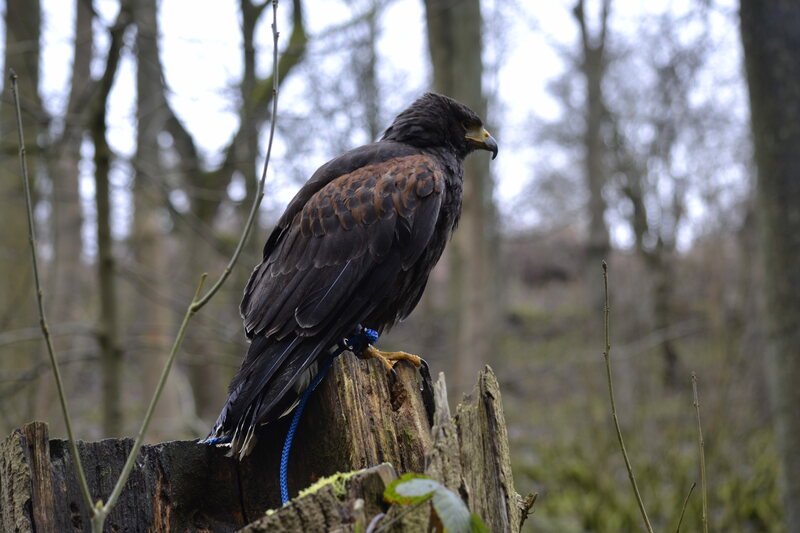 We had a Harris’s Hawk for our experience. These are beautiful birds found through South Western United States to Chile, Argentina and Brazil. 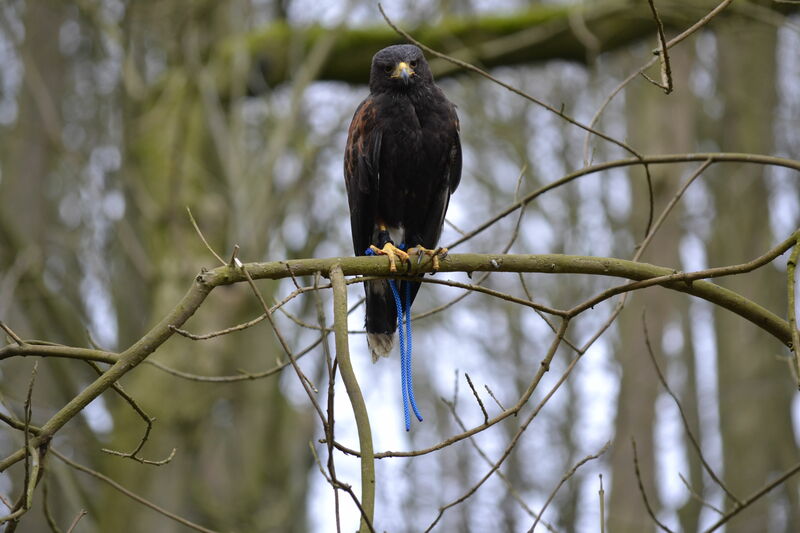 They are sometimes found in Britain, where they have in all likelihood escaped from falconry centres. They live in woodland habitats as well as semi-desert. So the woods around the centre are not a million miles away from their natural habitat. They exist on a diet of small birds, mammals and lizards. 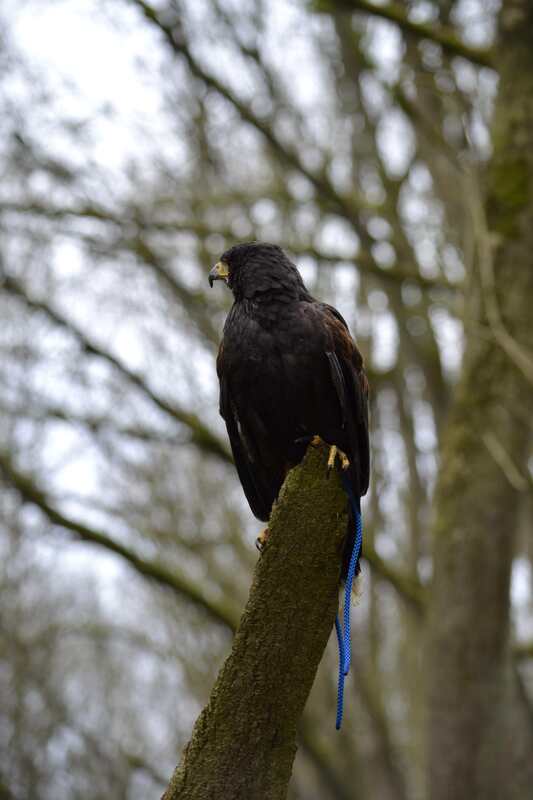 Within the woods today the hawk found the remnants of a few unidentified mammals distracting him from the walk. 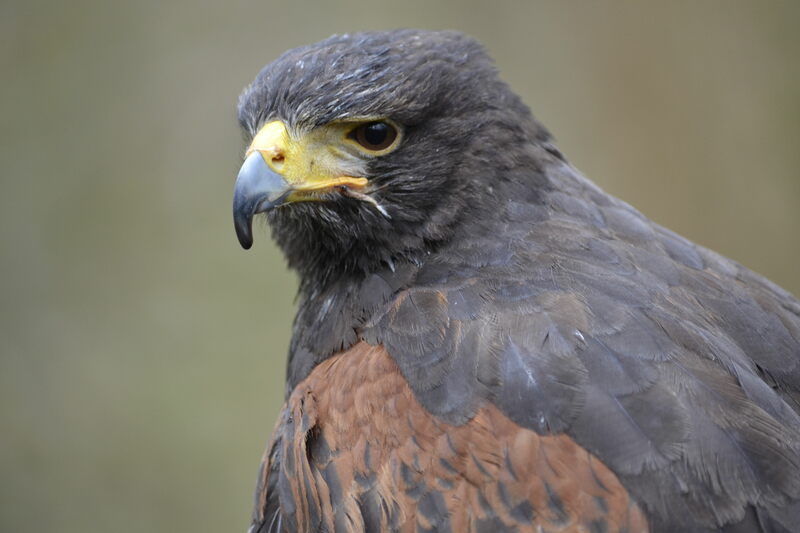 Harris’s hawk is unusual in that it will hunt in packs, where as most raptors are fairly solitary. They will hunt in family groups giving them the chance to catch larger prey than they otherwise could on their own. 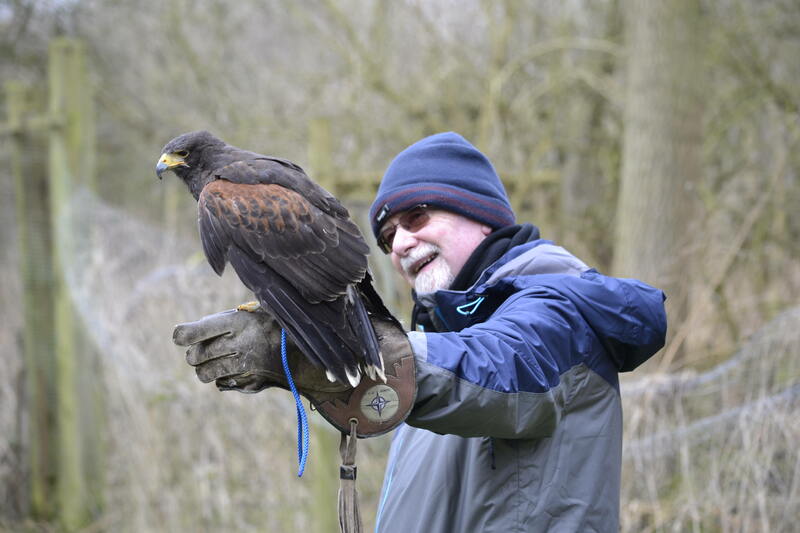 They are popular amongst falconry centres for the comparative ease to train in comparison to something like owls, which take much longer if they can be trained at all. Harry Potter has a lot to answer for with people thinking owls will make god pets. Truly a magnificent bird. A wonderful shared experience I would recommend treating someone to.